Students here range in age from 42 to 82. One is blind. One is a guy. One has fibromyalgia. One has post-polio syndrome. Reasons people give saying they can’t do yoga. –I have a bad back. Let me describe the people in the picture here. Their ages range from 42 to 82. One is blind. One has scoliosis and deals with chronic pain from post-polio syndrome. One has fibromyalgia. One’s a guy. Let me describe their teacher. I am 54. I took my first yoga class in 1995, shortly after I learned I had advanced osteoarthritis in my left hip. I had been told at age 25 that I had the knees of an 80-year-old. I had my first joint surgery a few months later. It left me more crippled in the knees than before. I had suffered from crippling back pain since I was 18. By the time I took that first class, I could walk about a quarter mile. I could go up and down stairs only with assistance. I had to use my hands to move my feet onto the gas pedal and brake to drive to that first class. I sat on the floor and burst into tears from the pain. My teacher gave me a stack of towels to sit on and I could stop crying. An hour and 15 minutes later, the back pain was gone. I began studying how to teach and then began teaching in 1997. Fifteen months later I had to have that left hip replaced. The doctor told me I would have been there much sooner if it hadn’t been for the yoga. Three months later, I had the second hip replaced. My recovery period: five weeks. At week four after each replacement, I was walking up and down Mt. Rubidoux, a 3.5-mile round trip on a big hill in my hometown. My doctor also attributed that recovery pace to the yoga. The doctor also noted that my entire spine was degenerating, as were all my joints. In 2004, although my back pain was mostly gone, I was aware that damage existed and I had sharp pain in my neck. I had X-rays and then an MRI done. The lowest disc in my spine was completely gone; next one up was half gone; I had ground bone away from my lowest vertebra; I had bulging discs and bone spurs in my neck. 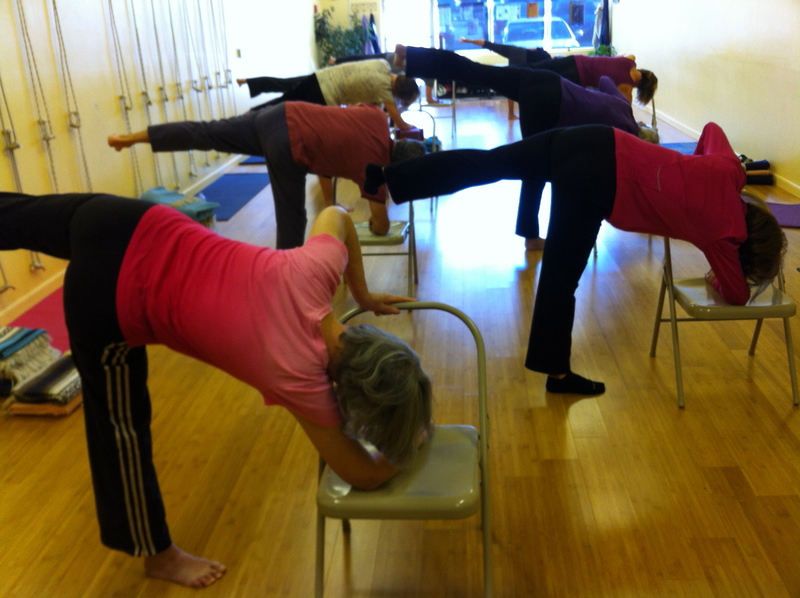 I set to work on the neck problems in my yoga practice and the pain was gone in about two weeks. When I started practicing yoga and for years after I started teaching, I couldn’t come anywhere close to touching my toes. I couldn’t do backbends, I couldn’t do forward bends, my standing poses were narrow and wobbly. Even as a teacher, I felt frightened in most poses all the time. I still do. What got me going in yoga: pain. What kept me there: hope. And that’s what keeps us all coming back. This entry was posted in Philosophy, Physical limitations on April 13, 2013 by Sadhaka. Much is written relative to Yoga Sutras 1.12, on practice and detachment, and 1.15, on renunciation as detachment from desires. Most writings deal with how to detach from pleasure. Perhaps this is because commentators view that as the harder thing to do. I don’t agree and I wish more had been written about detaching from pain. I could use some help on that. Pleasure is fleeting, and most of us know that. Pain seems so much more enveloping and hard to escape. And maybe that is the problem, that we try to escape pain. This is far from trying to detach. This topic came up while e-mailing about a yoga workshop on grieving that was to include a discussion on “embracing change”. My correspondent felt this meant accepting change “happily or willingly”. There is a place between being happy about change or hating it. Neither is detachment. I think that the trick, the pratipaksa, contrary thought, to hating change is not to embrace it, but to find equanimity within it. That seems like a good thing to aim for, given change happens, no matter our will. I think back to some things Manouso Manos said during a workshop in March 2011 in Los Angeles about luck and free will and our lives’ involving both. That to do yoga, we must “show up”. This is our act of free will. In the midst of luck, good or bad, or change, good or bad, we can act from free will. This seems to me to say not that we are embracing change or pain or pleasure, but that we exercise the will to exist within ourselves in the midst of it. This is the path tosantosa. “Purva-paksa: The opposing point of view.” That’s the glossary definition provided by Edwin F. Bryant in his book, The Yoga Sutras of Patañjali: A New Edition, Translation, and Commentary. Christie walks up the wall for her handstand, full arm balance, adho mukha vrksasana. I’m a yogi with no woo-woo. Just Christie Hall, a yoga practitioner – yoga sadhaka – with both her feet on the ground (except when I’m in one of my favorite inversions). My students and my teachers inspire me in my life as a full-time yoga teacher. Step-by-step, I propose to tell their stories and a few of mine.